In April 1942 I was a child of 10 years living at Odd Down. My brother who was ten years older than me was in the army and my father was in the Odd Down Home Guard. On the evening of the Blitz I went to bed as usual and was awakened by my mother when the siren went off. My father had gone to meet up with the Home Guard. I was very frightened; the noise was very loud with lots of explosions and planes flying very low. We crouched under the table and I remember wanting to go outside and run away from the awful noise. I can't recall how many times the All Clear went and we thought it was all over, but then the warning would go again. We didn't know where father was, but assumed he was with the Home Guard helping out somewhere. Eventually morning came and we were very worried and frightened as my father still hadn't come home. He returned at last at 11 o'clock. 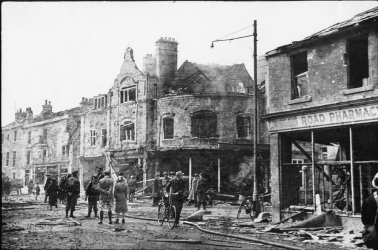 He was very tired and covered in smoke and grime, and said that the Odd Down Home Guard had been 'helping' on the Bear Flat which had been bombed badly. We later learned that my father had in fact rescued a family of five from their flat over their drapery shop. Mr. Sellar, the owner, described the rescue to the local newspaper. The following night was another night of bombing and my father promised he wouldn't go away from Odd Down. 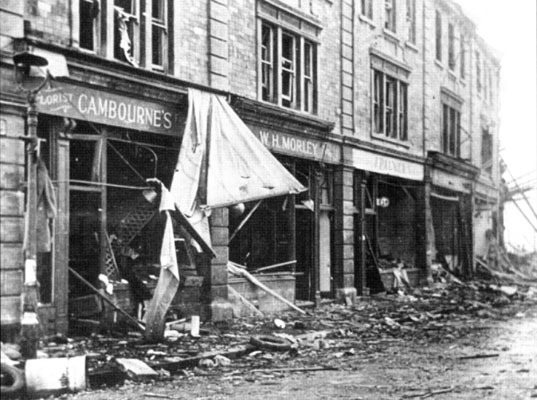 Several shops near us had a direct hit and all the windows and doors were blown out. Several people at Odd Down were killed by the gunfire from low flying planes. We had no water or gas for several weeks and we had to go to a place on the Old Fosse Road with containers to queue for water. There was an awful smoky smell in the air for several days. My mother cooked all the meals on a small open fire for several weeks until we had gas again. This was difficult, as there were six in the house by then, because my grandparents and an aunt came to stay after they were bombed out from their house in town. Sergeant Brown's medal was officially awarded "For gallant conduct in carrying out hazardous work in a very brave manner". Later my father was awarded the British Empire Medal for Bravery for that rescue, so he had to go to Buckingham Palace to receive it from King George. In those days. only two other people could go as well. As my brother was away in the army I had the honour of going with my parents. I recall being excited but not knowing what to expect. The day before the investiture we travelled to Hounslow to stay over night with a relative. The next day we travelled into London by bus. When we got to the palace we had to join a long queue outside the main gates. I wore my best coat and had a new pair of knitted gloves. They were khaki with daisies embroidered on them. At last we filed in and went through an archway into a courtyard and up some steps covered in worn red carpet with Beefeaters on each side. We went into a long room and sat on rows of chairs. The people that were receiving medals went into another room overlooking the garden. As my father was a gardener (he worked for Blackmore and Langdons) he was pleased to see the garden. While we waited there was an orchestra playing and then at last there was a murmur and we all stood up - the King had arrived, but all that I could see was the top of his head. The people to be invested all filed in and when it was their turn they walked up to the King to receive their medal. I was too short to see when it was my father's turn, which was a shame, but I know I enjoyed the day but was rather disappointed not to see the princesses. 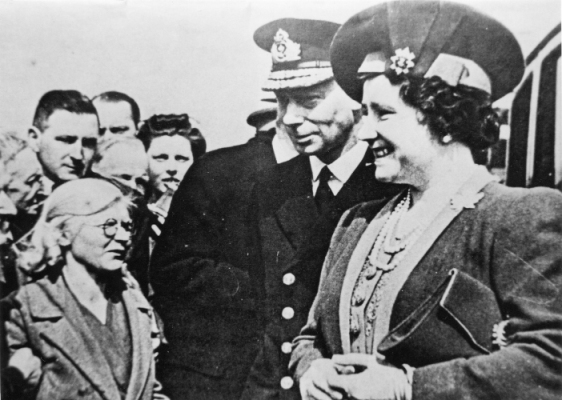 King George VI and Queen Elizabeth made a visit to Bath in May 1942. "The princesses", that Barbara was disappointed not to see, were Princess Elizabeth (now Queen Elizabeth II) and Princess Margaret. Bear Flat suffered a lot of damage, as these pictures show. Another picture of a different part of Bear Flat is in the Rescue section, where you can read what Sergeant Brown did to deserve his medal.